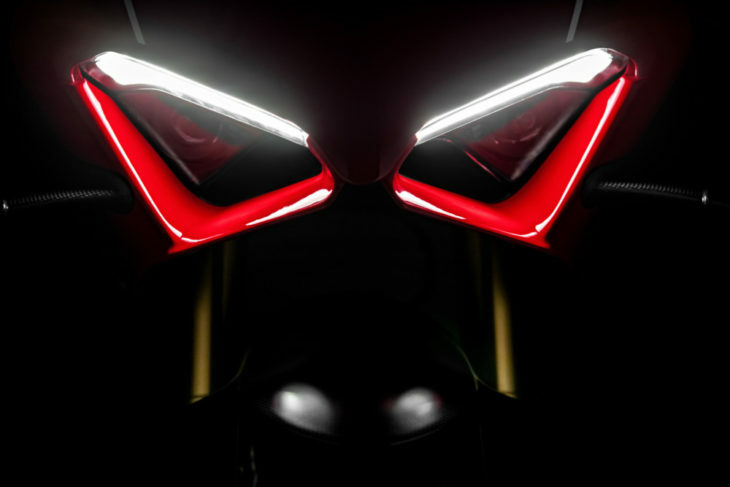 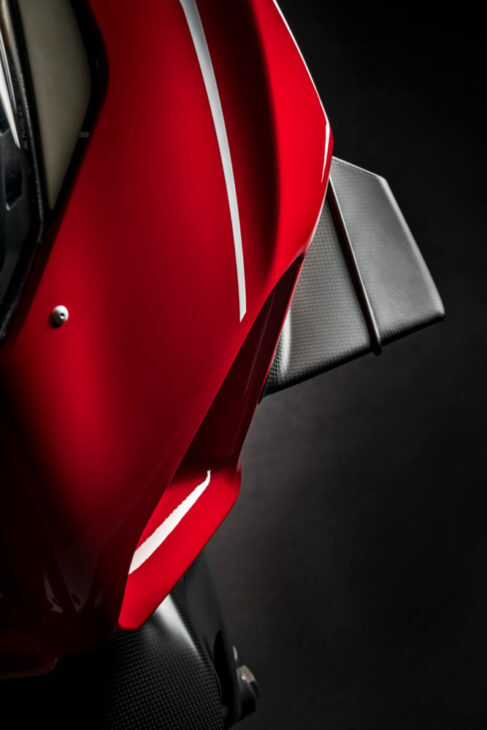 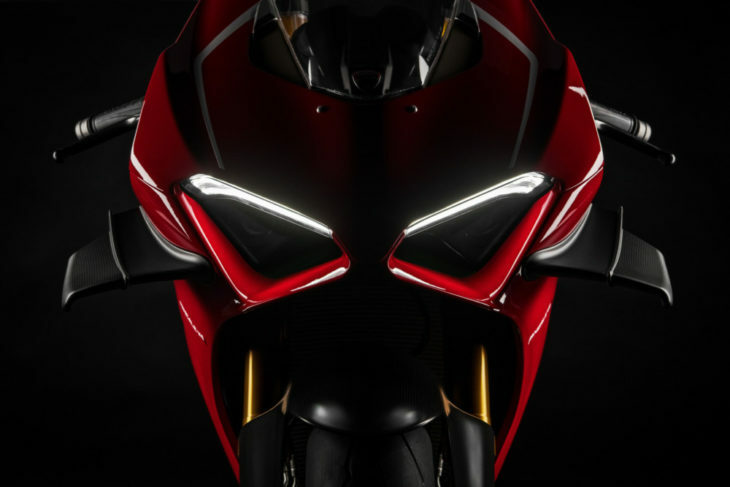 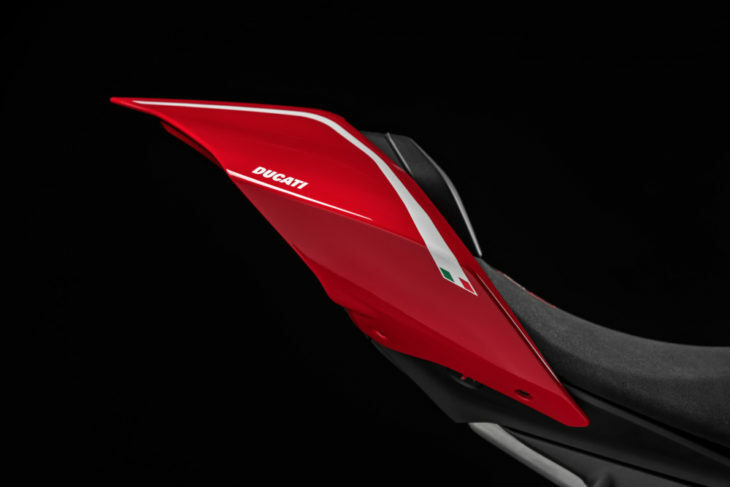 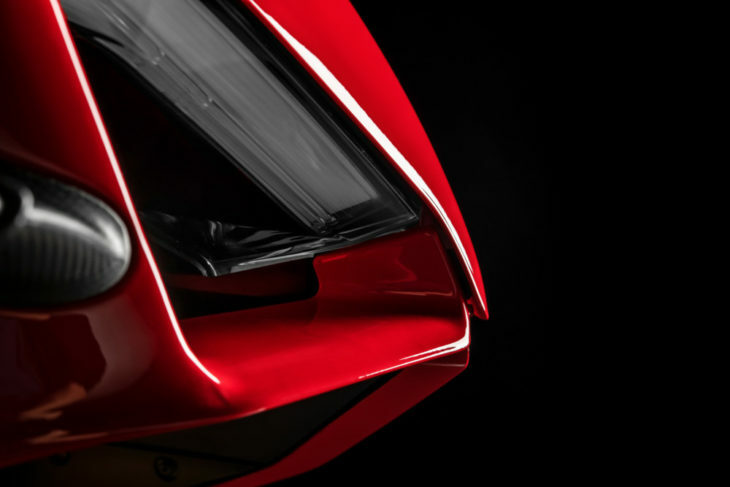 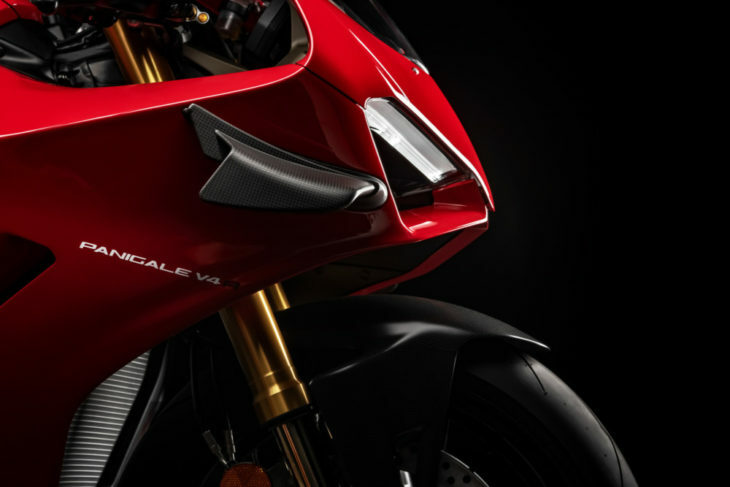 2019 Ducati Panigale V4 R First Look—The motorcycle Ducati hopes will finally land it the WorldSBK Championship win for the first time since Carlos Checa in 2011 is here. The 2019 Ducati Panigale V4 R will replace the current L-twin Panigale from 2019 onwards, bringing a formal end to Ducati’s storied line of twin-cylinder racing superbikes. 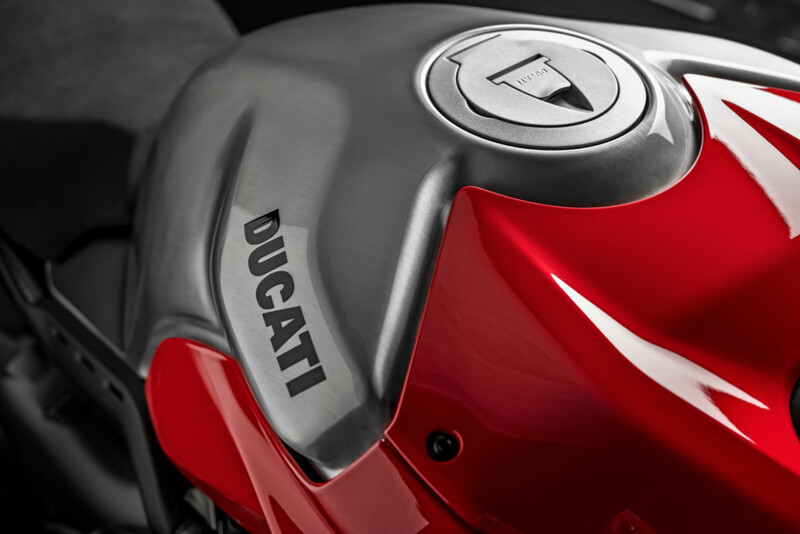 Helloooo, baby! 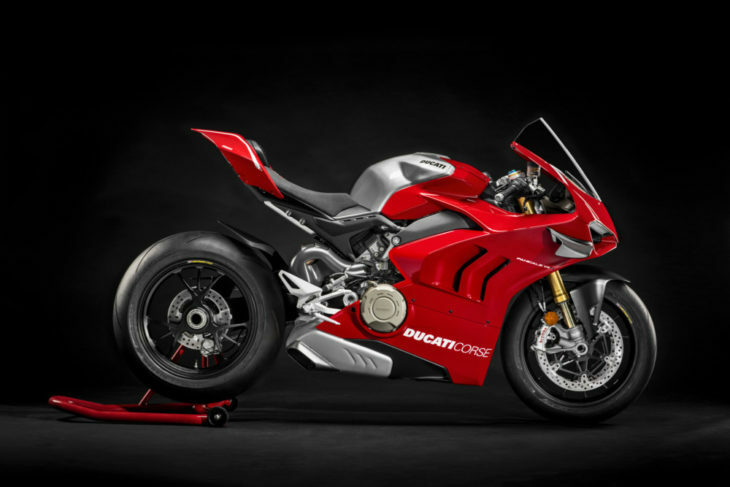 This is the production bike Ducati hopes will finally give the Panigale name a first WorldSBK title. 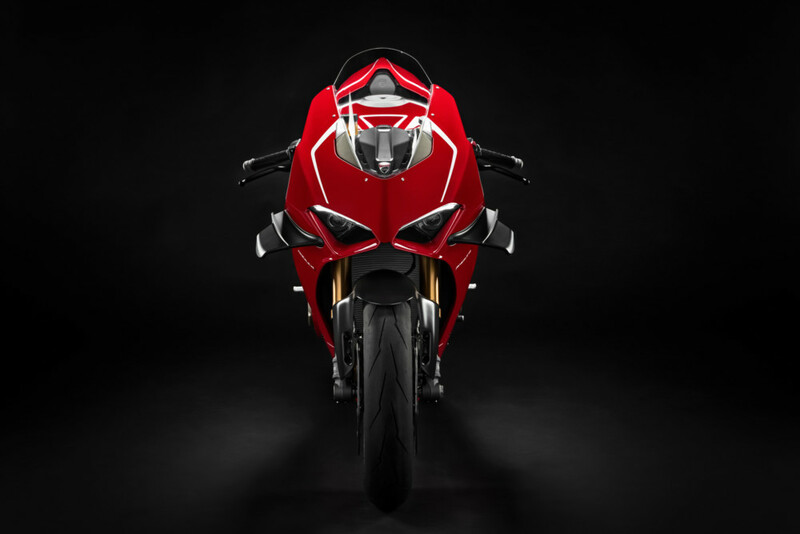 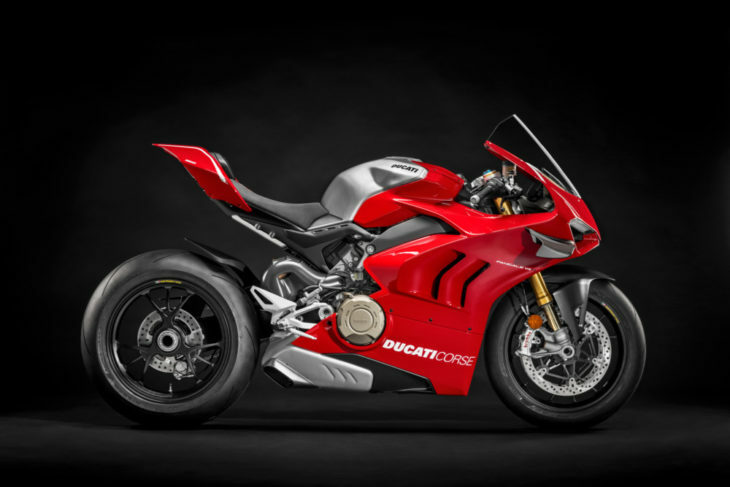 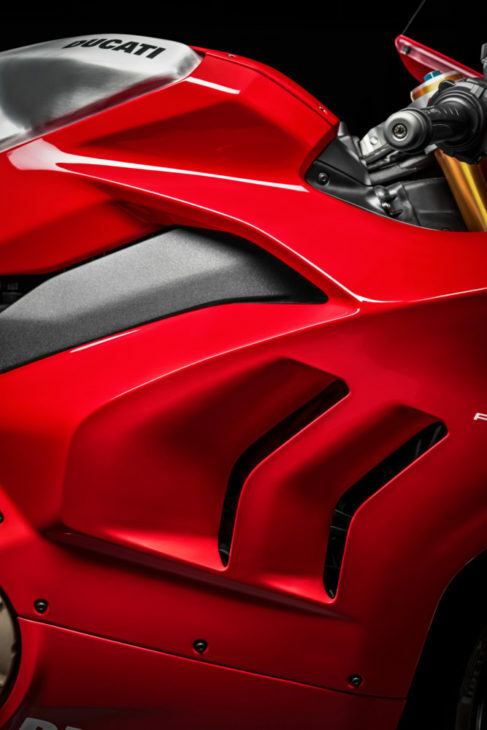 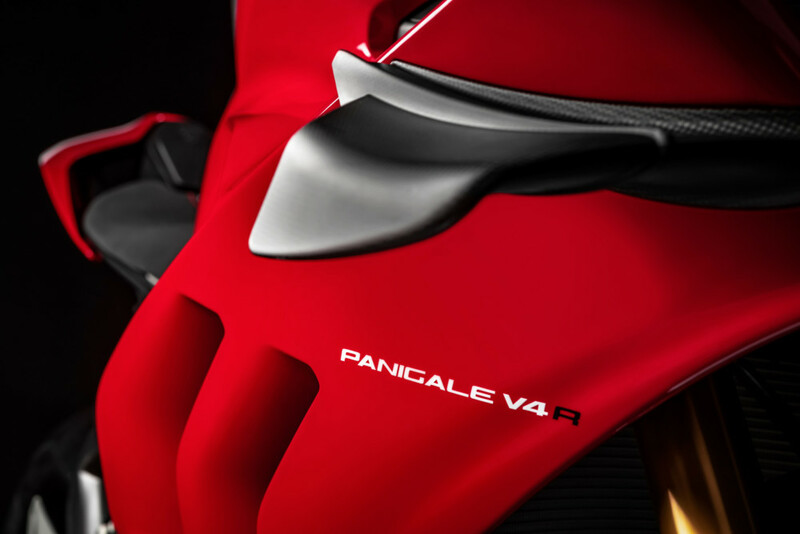 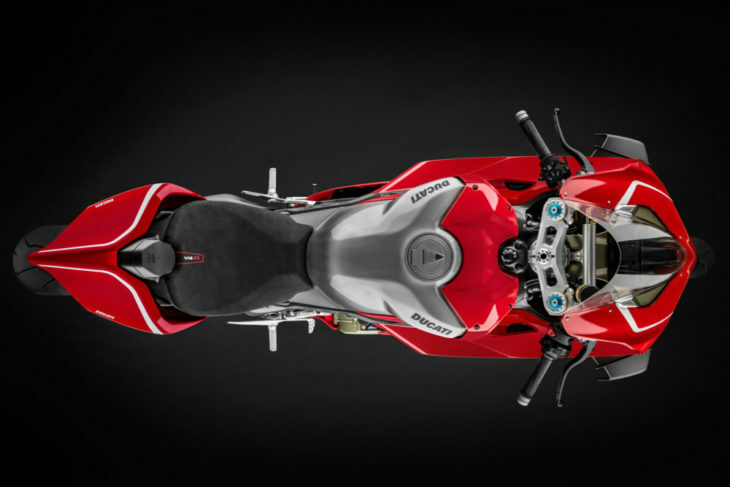 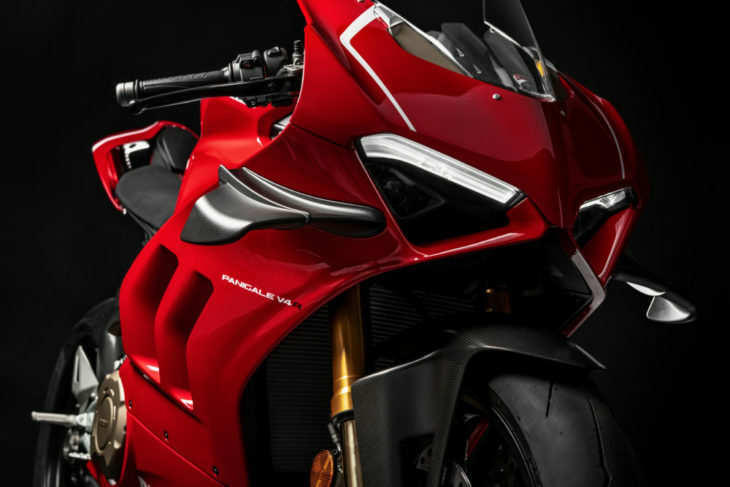 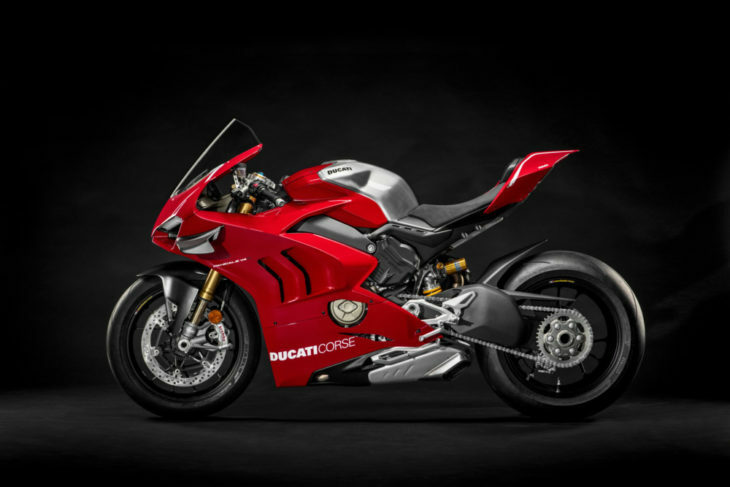 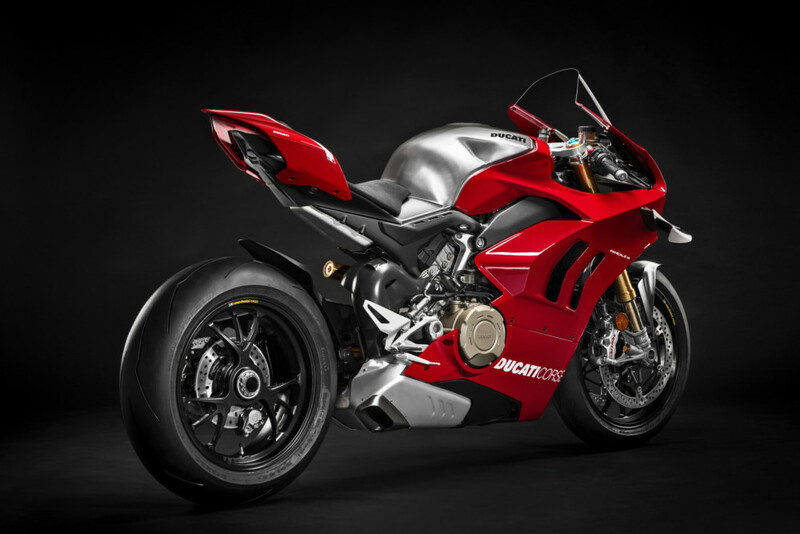 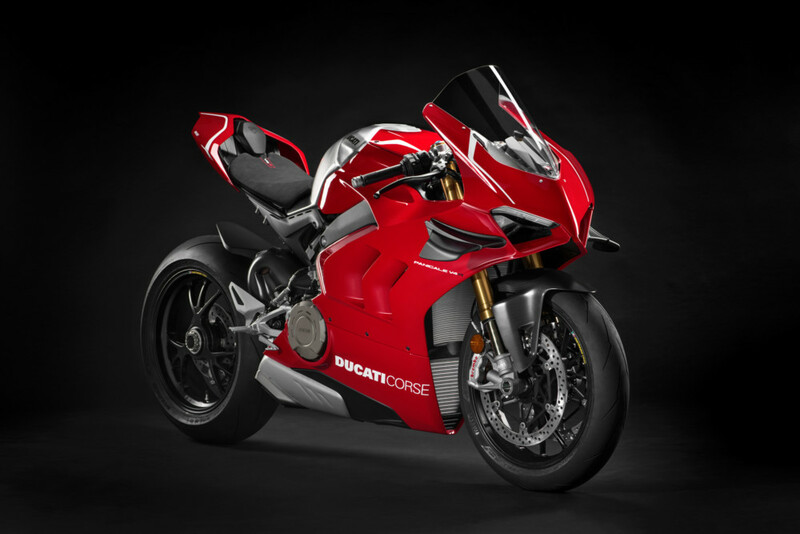 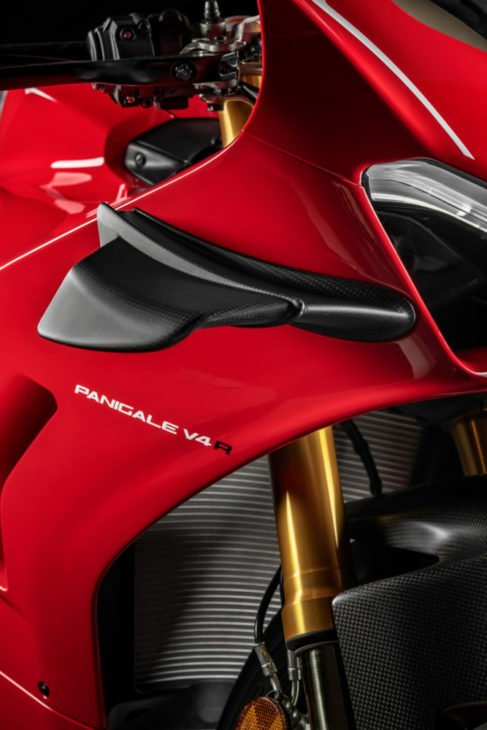 The new 2019 Ducati Panigale V4 R is the superbike racing spec version of the Panigale V4S that debuted earlier this year. 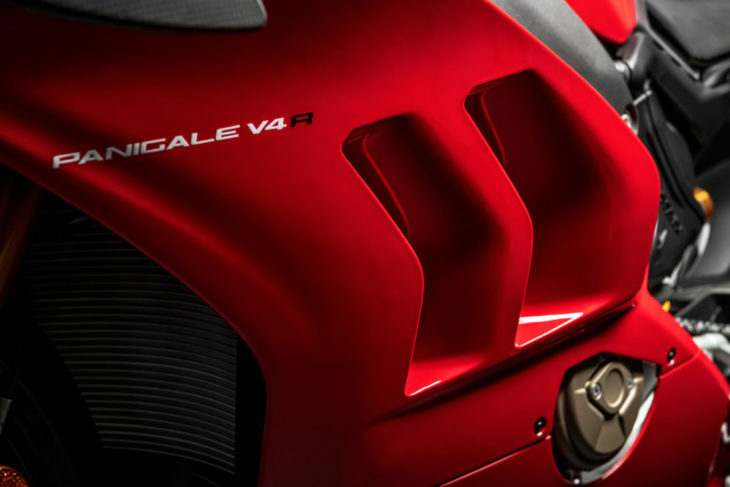 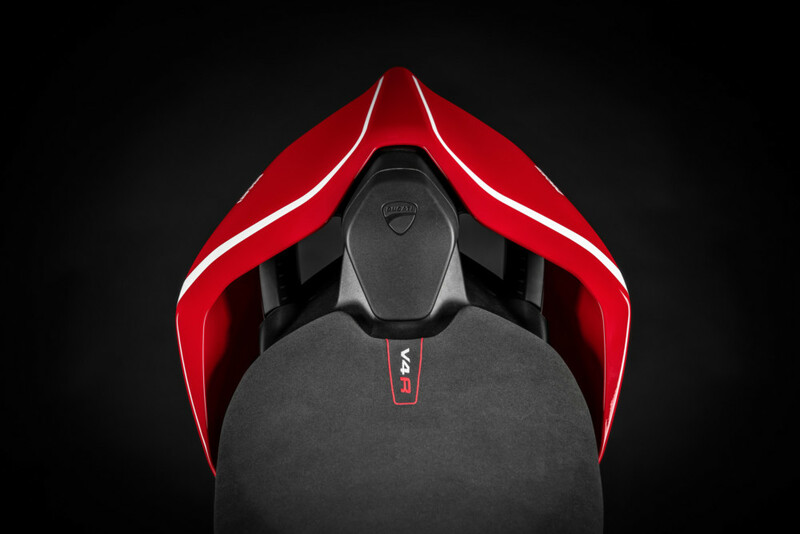 The 998 cc Desmosedici Stradale R version will crank out a claimed 221 hp at 15,250, which is a healthy 2250 rpm higher than what the V4S’s peak power is claimed at. 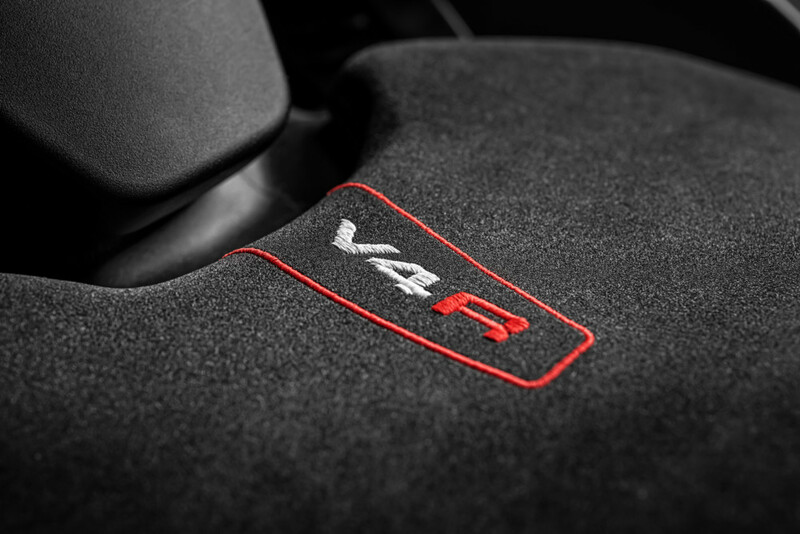 This figure gets boosted to a whopping 234 hp when the V4 R is fitted with the Akrapovic racing exhaust. 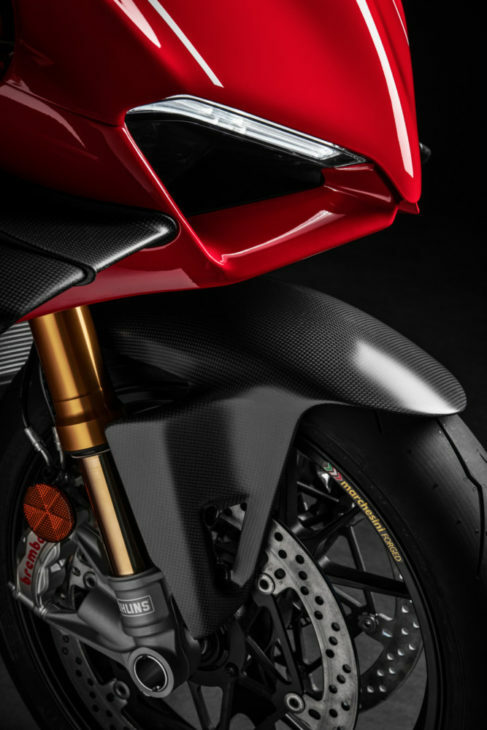 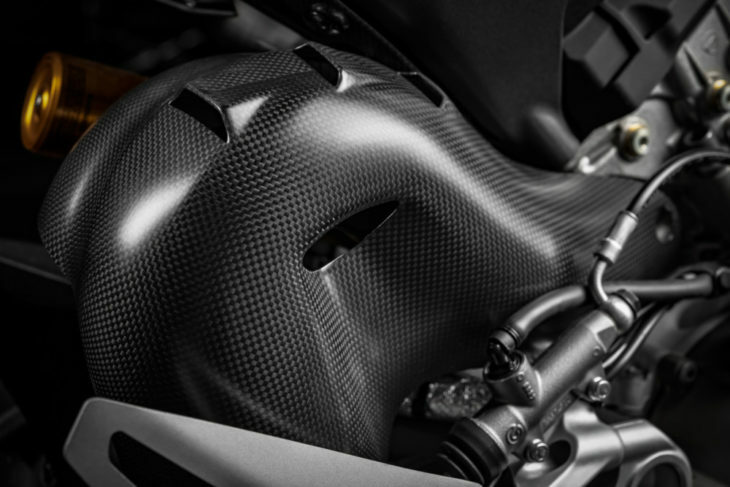 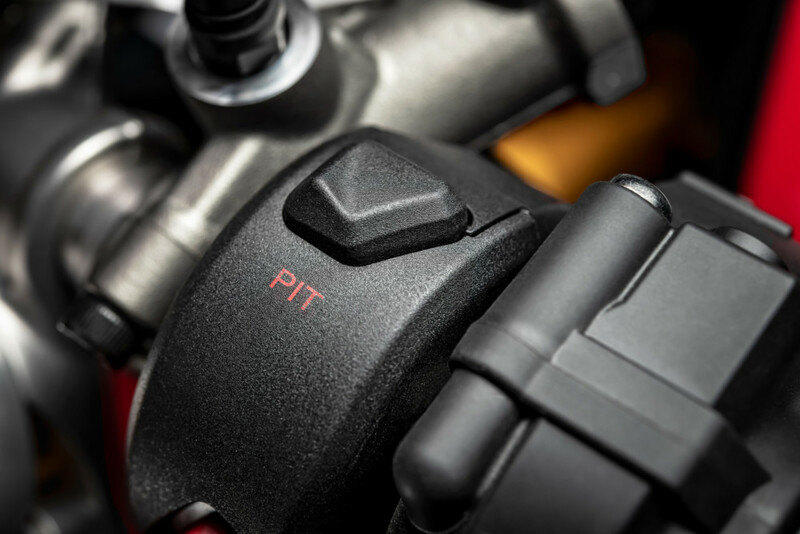 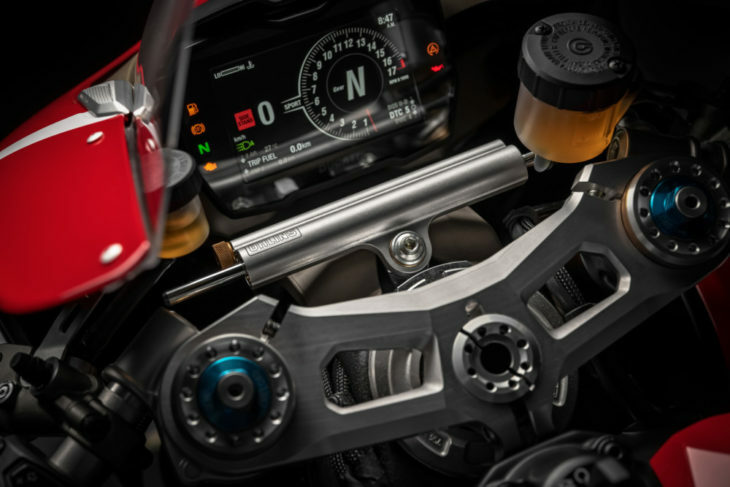 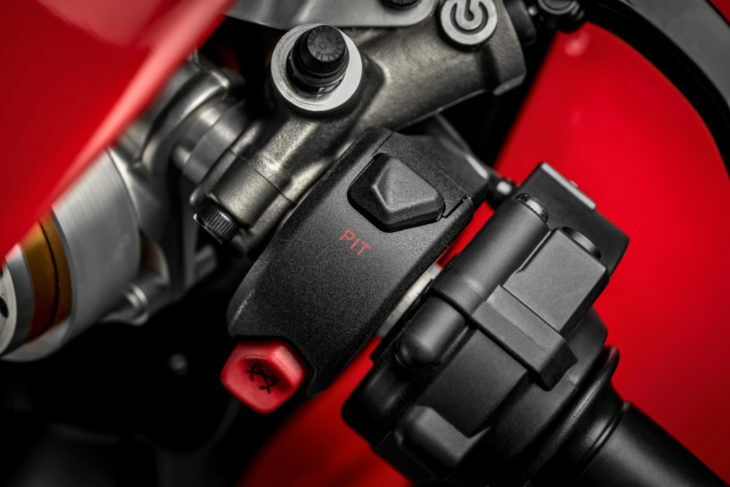 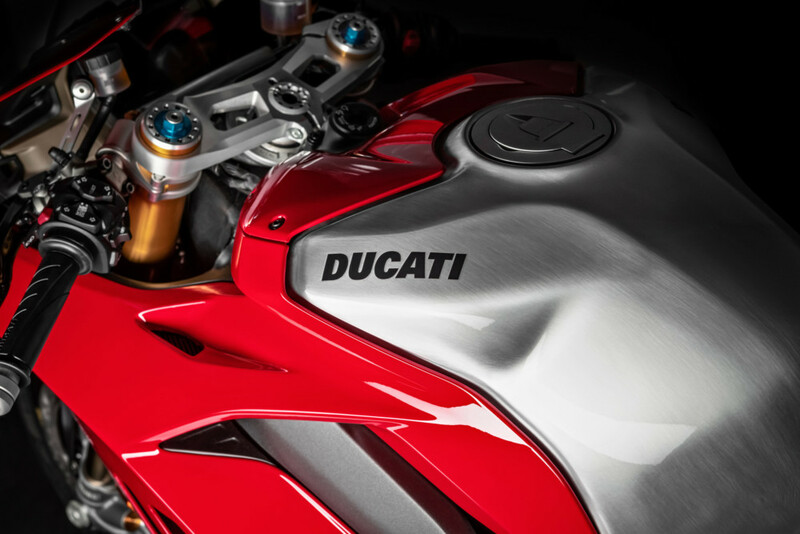 Lighter internals, including a crank that’s lost 1100 grams of overall mass, helps the new race-spec motor spin up considerably faster than the V4 S in Ducati’s Twin Pulse firing order, essentially firing the two left cylinders closely together, followed by the two right cylinders. 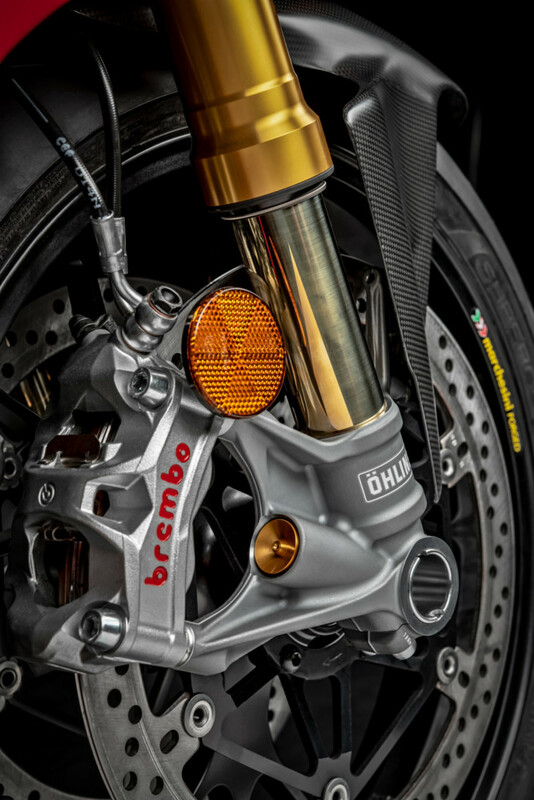 This motor is used as a stressed member of the chassis in Ducati’s Front Frame design, the same as the V4S. 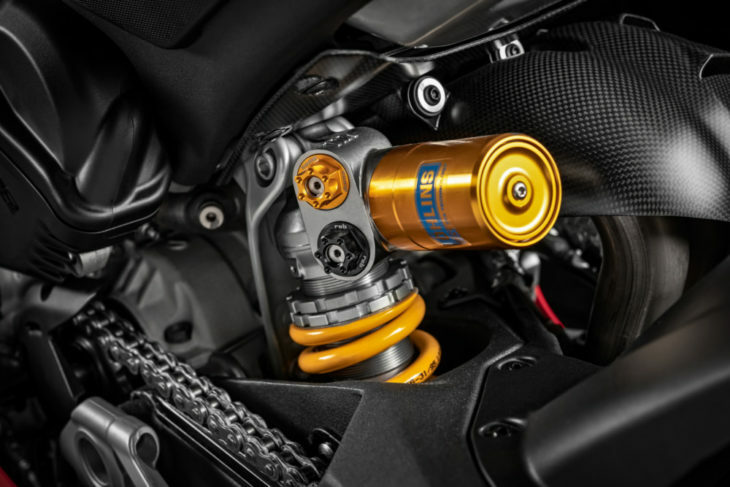 The frame itself is now painted black and is lighter and stiffer than on the V4S, and the swingarm pivot can now be adjusted up to four positions in 2mm increments. Unlike the V4 S, the V4 R does not come with the Ohlins Smart EC 2.0 electronic suspension, instead, you’ll be getting a mechanically adjusted, pressurized Öhlins 43 mm NPX 25/30 fork, 600 grams light than the fork on the V4 S, with TiN treatment and, at the rear, an Öhlins TTX36 gas-charged shock. Of course, the V4 R will get every one of the Ducati electronic controls with three riding modes of Street, Sport and Race, the Bosch six-axis Inertial Measurement Unit, Bosch Cornering ABS, Ducati Traction Control Evo, Ducati Slide Control, Wheelie Control, Power Launch, Quick Shifter, Engine Brake Control Evo, as well as access to the Ducati Data Analyzer and Ducati Multimedia System. 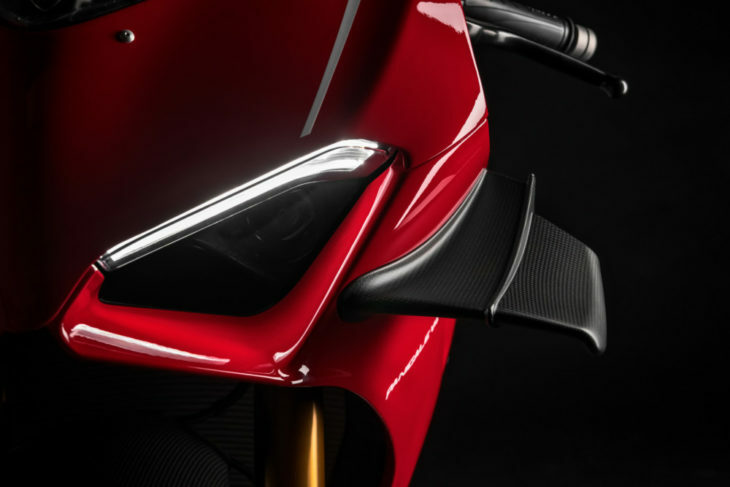 As for the bodywork, the Ducati GP16 MotoGP weapon takes responsibility for the winglets on either side of the front fairing of the V4 R, the production winglets being ripped straight from the track. 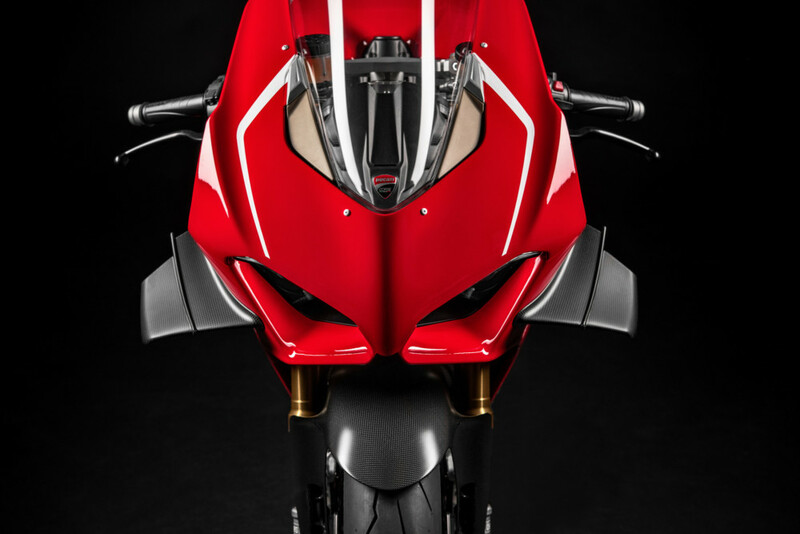 The screen, front and side fairings have all been put through the wind tunnel to change the shape slightly and reduce drag. 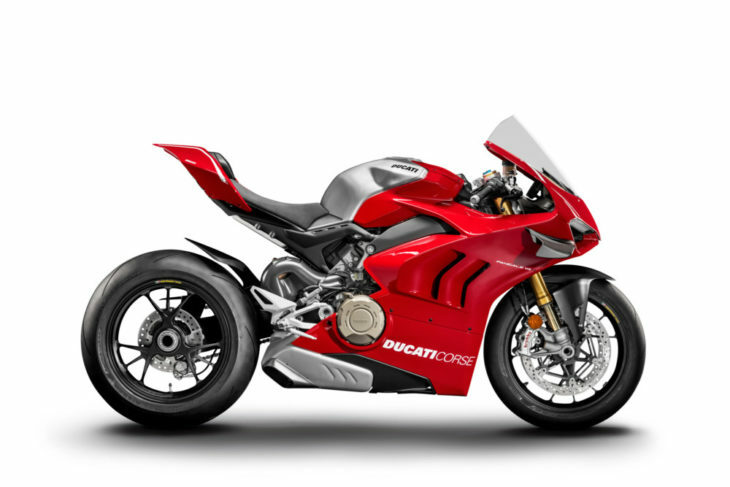 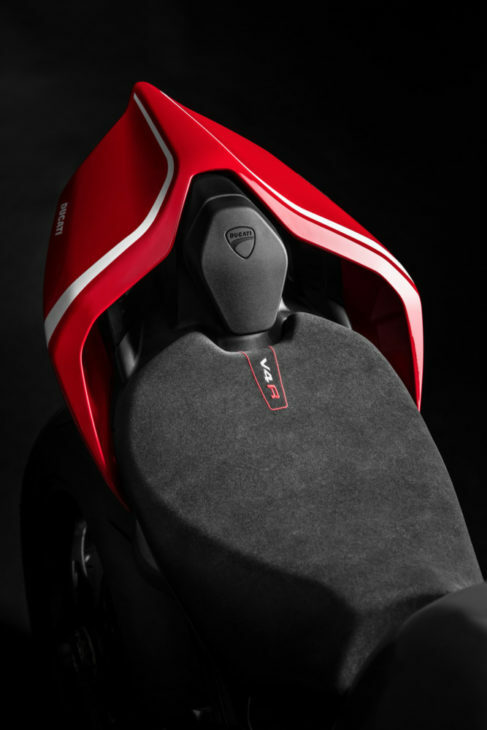 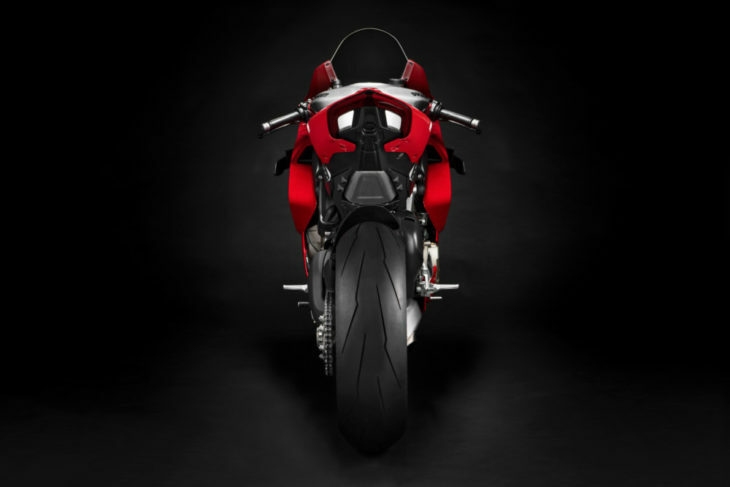 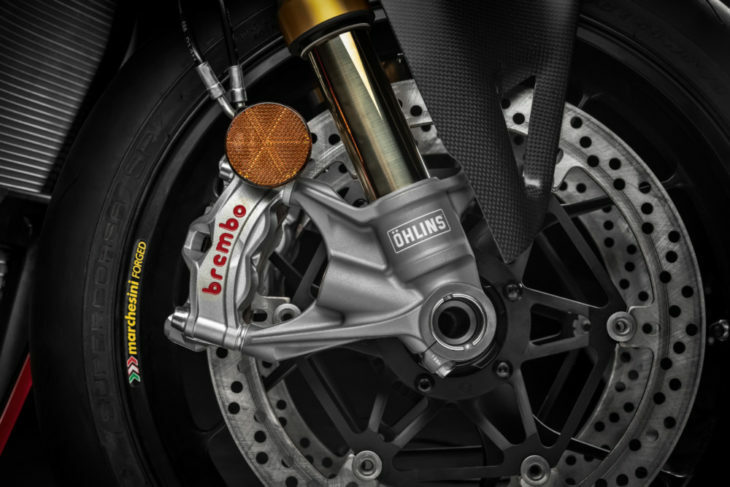 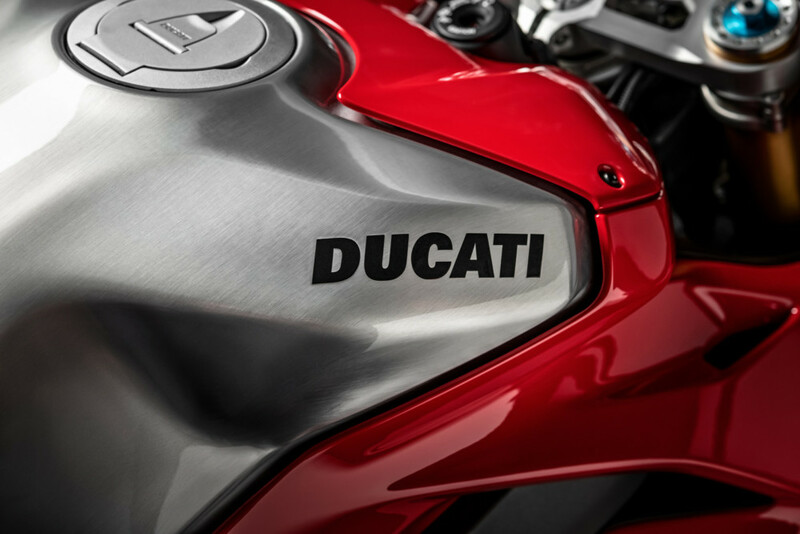 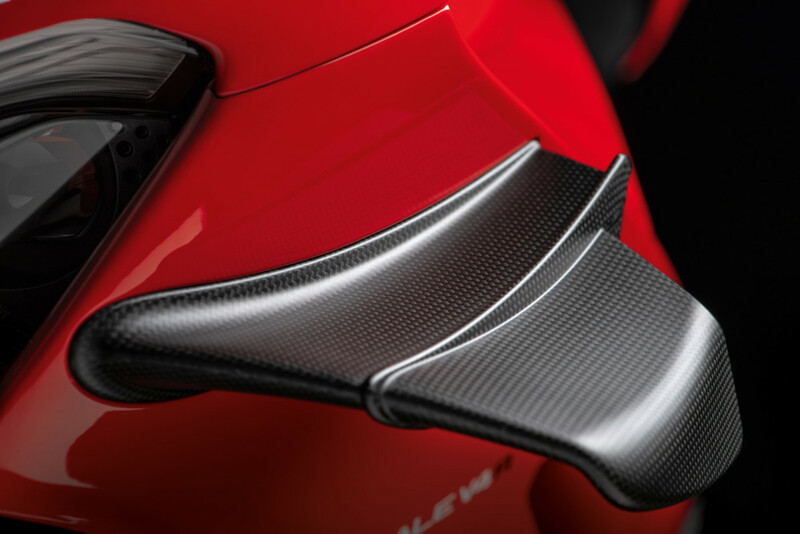 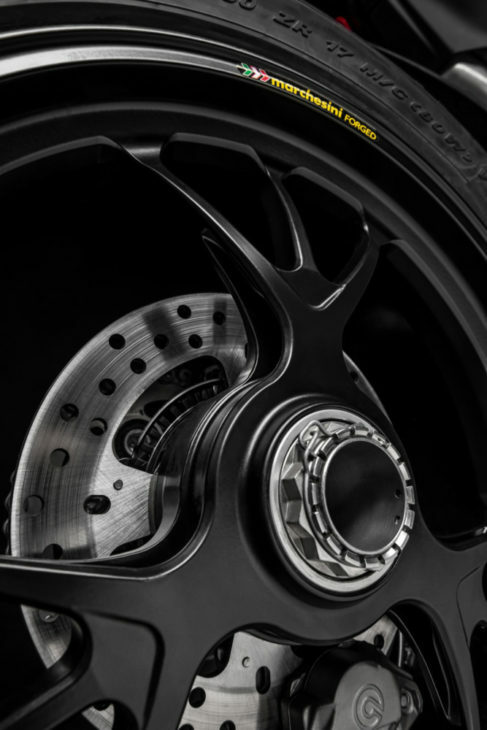 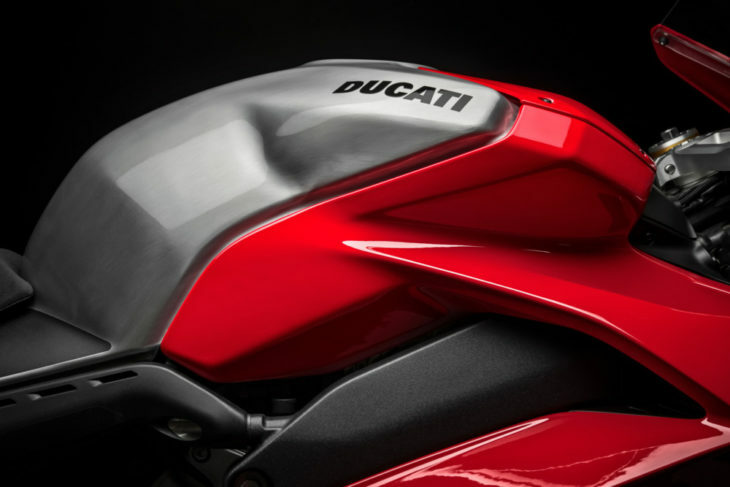 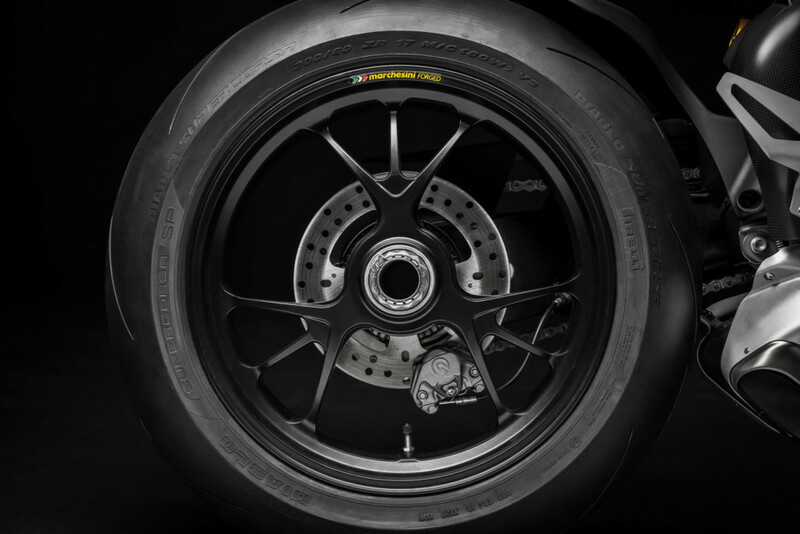 No word as yet on price and availability in the U.S.
Electronics package with 6-axis Inertial Measurement Unit (6D IMU) including: ABS Cornering Bosch EVO; Ducati Traction Control EVO (DTC) EVO; Ducati Slide Control (DSC); Ducati Wheelie Control EVO (DWC) EVO; Ducati Power Launch (DPL); Ducati Quick Shift up/down EVO (DQS) EVO; Engine Brake Control EVO (EBC) EVO.